If you are a shareholder you must be anxious to know what's happening in the company whose shares you hold and how it has been performing. One of the ways to find out is to look at the quarterly numbers published by companies. 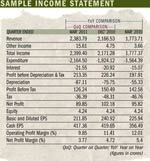 Quarterly results are the window made available to the general public to understand the company's performance. These are produced in a predefined format that a company must adhere to. According to the market watchdog, Securities and Exchange Board of India (Sebi), guidelines it is compulsory for every listed company to produce quarterly results. Quarterly results are early indicators of the company's progress towards its projected yearly profit targets. Have you had a look at the results of the companies whose share you hold? May be you have. But did you go beyond looking at the net profit figures. If you are one of the millions who are not expert at reading the numbers, the chances are that you did not. From an investment point of view, zeroing on net profit may not give you the right picture at a given point. This is because there are certain deductions that may 'artificially' eat away earnings leaving nothing on table. It happens when deductions such as depreciation, tax or amortisation is taken into account. This eventually shows up as a 'technically' loss-making enterprise, but it may not be the true picture. "It is not necessary that a stock will decline after a sudden fall in profitability. Share price is also a function of street expectations." Alex Mathews, head of research at Geojit BNP Paribas Financial Services says, "Investors should look not only at the net profits figures but also other details like sales growth, debt structure, whether the net profit growth is due to any one time gain and reasons for increase or decrease in expenditure." Though, it is not easy to analyse numbers like a professional would do, but even a lay person can go beyond the net profit figures to try and gauge what's happening in the companies. So what should you look at while reading the quarterly results put out by the company? We give you a snapshot of some of the more important parameters that you should look at and what they mean. Other than net profit, there are few more terms such as gross sales, net sales, expenditure, operating income and earning per share (EPS) that can help you to get a better understandings of where the company stands. Gross Sales: Gross sales are also called as the 'top line' or revenue or total sales. Samar Vijay, director, InvestCare says, "A consistent increase in the top line shows strong growth in business. However, the quality of top line needs to be examined. Sale of fixed asset can increase the top line which should not be confused for strong growth. This can be verified from the balance sheet where fixed asset will show a reducing pattern." Gross sales are the sum of all sales during a given period. Net Sales: From gross sales you can derive net sales by deducting sales return, sales allowances, and sales discount from gross sales. Operating expenses: These are expenses that arise during the course of running a business. Operating expense consists of items such as salaries paid to employees, research and development costs, legal fees, accountant fees, bank charges, office supplies, electricity bills, business licenses. Operating Profit: When operating expenses are deducted from net sales you get the operating profit, or earnings before interest, tax, depreciation and amortisation (EBITDA). Sanjeev Zarbade, vice president (private client group research), Kotak Securities says, "Operating profitability reflects ongoing business conditions and shows how efficiently the management is running the business." OUTSTANDING SHARES are the number of ordinary shares that, after their issue, have been sold to and are being held by shareholders other than promotors. Price-to-earning ratio or P/E ratio is calculated by dividing current market price of a share by annual earning per share. A high P/E suggests that investors are expecting higher earnings growth in the future compared to companies with a lower P/E ratio. The ratio needs to be compared with peers to find out the relative valuation. Amortisation means paying off a debt in regular instalments over a period of time or the deduction of capital expenses over a specific period of time (usually over the asset's life). More specifically, this method measures the consumption of the value of intangible assets, such as a patent or a copyright. Net Profit or net income: In the income statement you can find details about tax and loan repayment which when deducted from operating profits gives you the net profit. The term net profit or net income is popularly known as 'bottom line', which shows the company's net earnings or losses. Earning Per Share (EPS): It is the amount of earnings per outstanding share of a company. 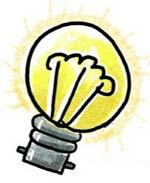 Outstanding share refers to those shares which are trading in the market. EPS is arrived at by dividing net profit by numbers of share outstanding. Rajesh Jain, executive vice president and head of retail research, Religare Securities says, "Rising EPS is a good sign of a profitable company." In the quarterly results you will find the term basic and diluted EPS. Basic EPS is the total earnings per share based on the number of shares outstanding. On the other hand, diluted EPS is used to gauge the quality of a companys earnings per share if all convertible securities were exercised. Convertible securities refer to all outstanding convertible preference shares and convertible debentures. Unless the company has no additional potential shares outstanding (a relatively rare circumstance) the diluted EPS will always be lower than the basic EPS. EPS also helps you to calculate price-to-earning ratio or P/E ratio. The P/E ratio of a share is a measure of the price paid for a stock relative to the annual net income earned by the firm per share. In general, a high P/E suggests that investors are expecting higher earnings growth in the future compared to companies with a lower P/E. Price-to-earning need to be compared with peers to find out relative valuation. A low P/E compared to peers trading at high P/E makes the stock a better buy at times. Interest Cost: It is the cumulative sum of the interest paid on loans by the company. "Rising interest cost depicts that the company has increased its debt. However, proper deployment of debt is important along with rise in sales and profit otherwise rising interest will eat the profitability of a company," says Jain. A single set of numbers will not tell you much. You need to compare it with the prior periods to gauge the direction the company is taking. There are two methods to compare the quarterly performance i.e. quarter-on-quarter (QoQ) or year-on-year (YoY). QoQ is a comparison of a quarter just prior to the current quarter. For instance a comparison of the quarter ended March 2011 with the quarter ended December 2010. This is also known as sequential comparison. However, YoY is the comparison of the quarter with the corresponding quarter a year ago such as comparison of the quarter ended December 2010 with the corresponding quarter ended December 2009. R Murali Krishnan, head'institutional broking, Karvy Stock Broking says, "YoY is used to measure the direction and consistency in performance. QoQ reflects the near-term pressures on the company and gives an indication on it abilities to achieve its long term projections as estimated by the consensus in the YoY." Kaushik Dani, head- equity, Peerless MF says that sectors which are prone to seasonal or cyclical fluctuations should be compared YoY and those that are not, should be analysed QoQ or sequentially. Sectors like FMCG, retail, cement, auto and infrastructure can be analysed on a year-on-year basis. Similarly, growth in sectors like technology and telecom should be compared on a sequential basis. In some cases the net profit of companies shows a sharp and sudden decline during a quarter. Recently, the bottom line of State Bank of India (SBI) for the quarter ended March 2011 tanked around 99% to Rs 20.88 crore against Rs 1,866.60 crore in the corresponding quarter last year. However, the stock price of the company declined around 8% from Rs 2,413 on May 17, 2011 to Rs 2,236 on May 30, 2011. In other examples, Shipping Corporation of India (SCI) registered a net loss of Rs 6.17 crore, down 104.54% in the March 2011 quarter against Rs 135.85 crore a year ago. During the same quarter, net profit of Sterlite Technologies dipped 85.73% to Rs 10.30 crore against the corresponding quarter a year ago. However, the share price of SCI declined barely 1.85% to Rs 100.90 while Sterlite Technologies declined 20.21% to Rs 48.35 till June 24, 2011. As you will see, share prices in the above three cases reacted differently to the sudden fall in profits. Hence, there is no standard yardstick to gauge the impact of such a fall. A chance of a stock declining after a net loss or vice versa depends on the anticipation of investors and how the results have matched their expectations. If investors believe that it is a short-term phenomena, markets ignore the sudden drop in profit or revenue. "It is not necessary that a stock will fall after a sudden fall in the quarterly numbers. It is all a function of street expectations. If the street is expecting a loss and actual loss is lower than expected, then the stock price can actually move up," Sanjeev Zarbade of Kotak Securities added. Sometimes, long-term investors take advantage of short-term negative sentiments by taking long positions causing a fall in the price of a share. However, if the long-term outlook is bad for the company, then both short and long-term investors should move out. So should you buy or sell on the basis of the numbers put out by the company? Our advice is that generally you shouldn't unless you are certain about the direction that the company's business is taking. There are many other factors such as the business environment, plans and the fundamentals of the companies that one should take into the account while buying or selling. DD Sharma, senior vice president-research, Anand Rathi says, "Do not take buy or sell decision on the basis of quarterly results only. Investor should check other factors such as policies of the company and other fundamentals of companies."